Found my old camera with a card full of pics. This was one of them. It really illustrates well the dynamics between the dogs. Sadie and Violet are spooning, crashed out crazy puppies, and far away on the other end with his back away from the chaos is Puppy. Poor puppy. Those girls were on their own wave length and Puppy wasn't a member of their secret club. Puppy is happier now. He lives with Rob's parents where the pace of day to day life is more at his speed - more predictable. 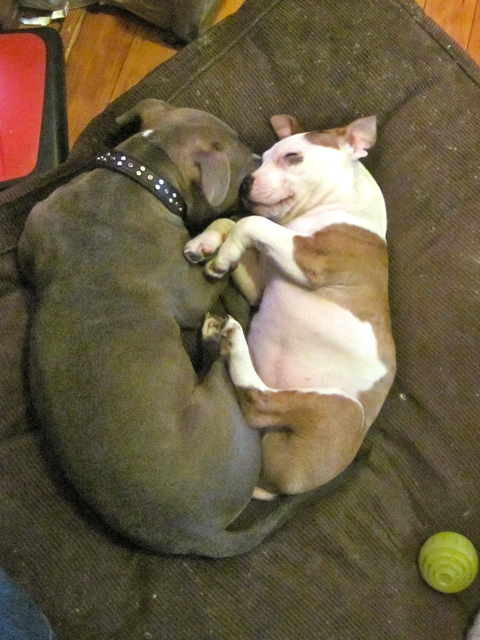 More spooning puppies. Damn they were cute.